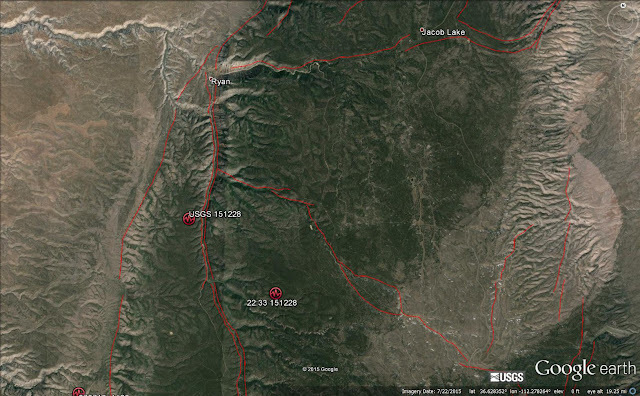 The Google Earth image at the bottom shows the revised location (lower red squiggle) determined using the AZGS-run Arizona Broadband Seismic Network vs the original location from the USGS (upper red squiggle marked "USGS") which did not use our stations. There are also reports of the quake being felt in Havasupai Canyon. Freeport McMoRan's founder, James R. Moffett, is resigning as Executive Chairman of the Phoenix-based copper and gold company, according to news reports. The Wall Street Journal said "Moffett served as chief executive of the company and its predecessors between 1984 and 2003. He co-founded McMoRan Oil & Gas Co. in 1969 and lead its eventual merger with Freeport Minerals Co. In 1988, under his leadership, the company discovered Indonesia’s Grasberg mine, one of the world’s biggest for gold and copper." It attributed his resignation to pressure from investor Carl Icahn, and the two-thirds drop in company stock in the past year. The Arizona Republic stated that "For years, Freeport-McMoRan had been Arizona's most profitable and most valuable corporation in terms of stock-market capitalization. The company was worth around $38 billion as recently as the summer of 2014 but now is worth just $8 billion." Freeport operates the giant Morenci copper mine in eastern Arizona [right, credit Freeport McMoRan]. 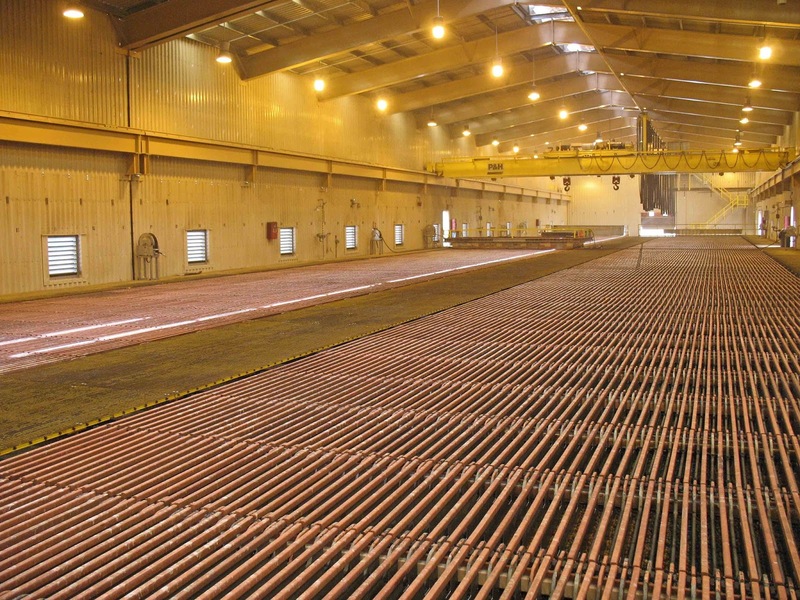 The company projected sales of 4.3 billion pounds of copper in 2015. · Water quality databases for recent and historical sample analyses along the spill area. · Interactive maps of current and past USGS water-quality sampling sites and real-time streamgages in the San Juan River watershed, including Cement Creek and Animas River. · Satellite imagery of the watershed area including both pre and post-event data. 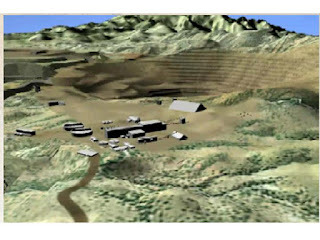 · A selected bibliography of past USGS reports on abandoned mine lands and natural sources of metals and acidity to streams in the Silverton area. The Arizona Geological Survey maintains an interactive web map with sample locations and results from all of the state and federal agencies monitoring the spill and its aftermath, at http://maps.azgs.az.gov/gold-king-mine-spill/. You can search for any samples that exceeded drinking water standards, and over what time period. 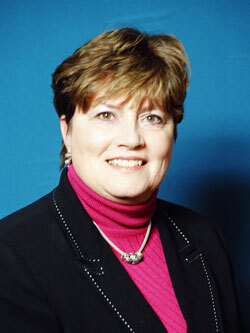 The U.S. Senate confirmed Dr. Suzette M. Kimball as Director of the U.S. Geological Survey. President Obama announced his intent to nominate Kimball as Director in January 2014, and she has been leading the agency in an acting capacity since February 2013. 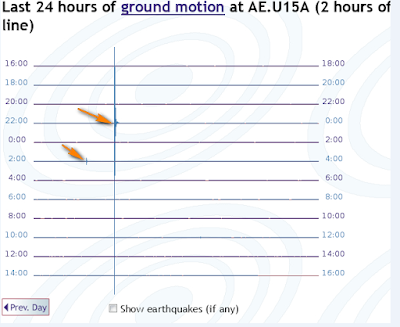 There was a magnitude 2.4 earthquake (orange star at right. 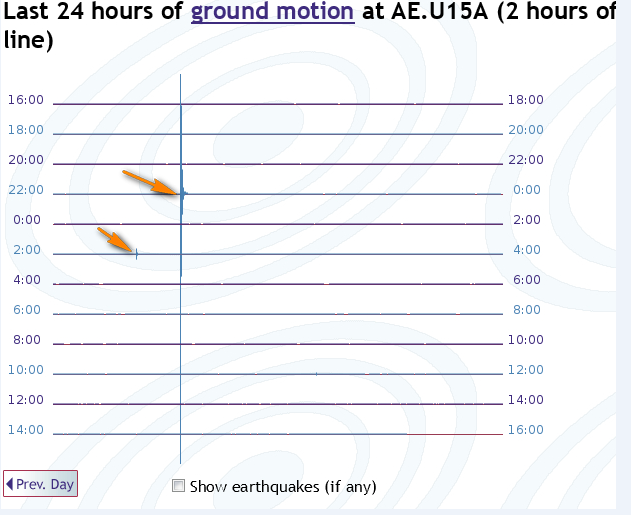 Credit, USGS) just after 11 pm on Friday night. about 9 miles south of Flagstaff. It's possible this is another aftershock to the magnitude 4.7 quake of November 30, 2014. 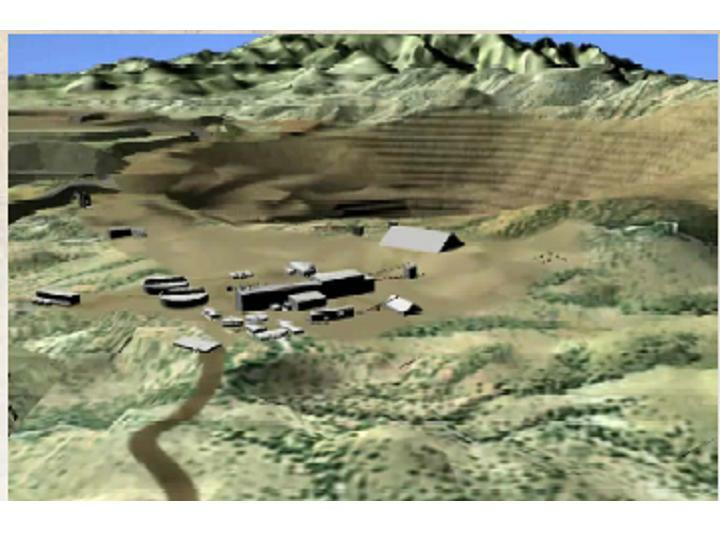 The permitting process for the Rosemont copper mine south of Tucson will cost $100 million. 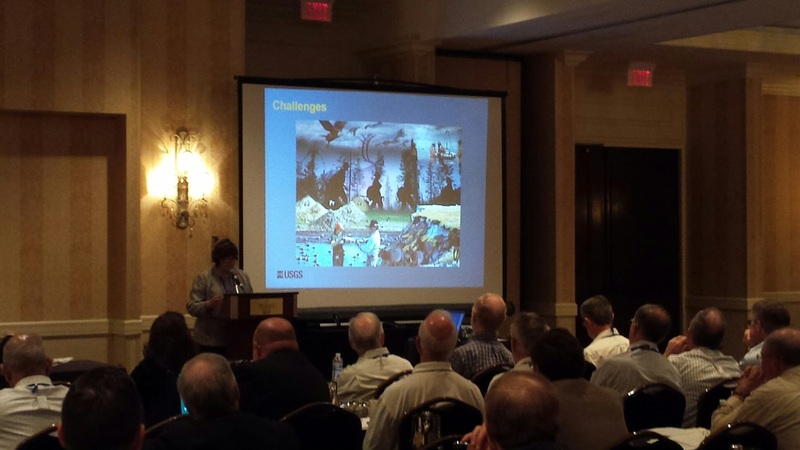 That figure was reported by Kathy Arnold of HudBay Minerals in a talk today at the annual SME Tucson conference. HudBay bought out Augusta Resources, former owner of the Rosemont project, in mid-2014 as a result of Augusta's challenge in finding enough resources to complete the permitting process. Opponents of the mine have been upfront in proclaiming their strategy of dragging out the permitting process as long as possible in order to make it too expensive for the mining company to continue. The average time to permit a new mine in the US is now 10 years, the longest period among developed countries, and the second longest in the world. HudBay Minerals CEO leaving to join Goldcorp. 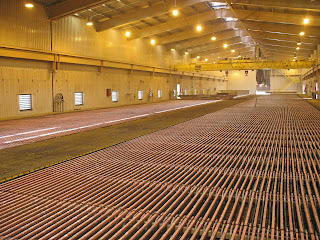 HudBay Minerals Inc. , which owns the Rosemont Copper Project in Arizona [photo credit, Rosemont Copper], announced today that David Garofalo has provided notice to the Board of Directors of his resignation as President and Chief Executive Officer. Mr. Garofalo advised the Board that he has accepted an appointment as President and Chief Executive Officer of Goldcorp Inc.
Vancouver-based Goldcorp was the world's fourth-largest producer of gold as of the last quarter of 2014. According to an announcement released today, Hudbay also announced that it has appointed Alan Hair as President and Chief Executive Officer, effective January 1, 2016. Mr. Hair has served as Hudbay's Chief Operating Officer since 2012 and he has held a number of senior leadership roles in business development and operations at Hudbay since 1996. Mr. Hair has worked in the mining industry for over 30 years and holds a degree in mineral engineering from the University of Leeds. "On behalf of the Board of Directors, I would like to wish David the very best in his new endeavour. We are pleased with the growth of Hudbay over the past five years under his leadership," said W. Warren Holmes, Hudbay's Chairman. "With Alan Hair assuming his new role as President and Chief Executive Officer, Hudbay is well prepared to continue the strategy of the past five years, and to optimize the safety, environmental and cost performance of our three new mines in this challenging metals market. Hudbay will also continue to seek accretive growth opportunities that fit our strategic criteria." "I appreciate the opportunity I have had to serve as Hudbay's President and Chief Executive Officer," said David Garofalo. "Our development as a company over the past five years is a testament to the hard work, dedication and competence of our employees across the organization. I am very proud of all we have been able to accomplish and I will miss the wonderful culture we have built at Hudbay. I am confident in the company's continued success under the leadership of Alan Hair and the very effective Hudbay team." 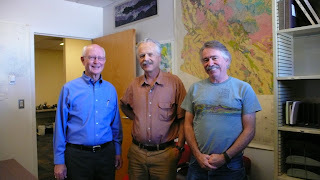 The Central Arizona Geology Club is starting their meetings 30 minutes earlier at 6:00 pm, to accommodate the earlier closing time of the Prescott Library [right] where they hold their meetings. 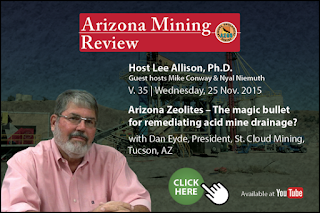 Using zeolites to remediate acid mine drainage - on latest episode of "Arizona Mining Review"
Zeolites are minerals comprised of silicon, aluminum, and oxygen that form frameworks full of cavities and channels that can work as "molecular sieves." Ted Eyde, President of St. Cloud Mining in Tucson, joins us on this month's episode of Arizona Mining Review to describe how certain zeolites are being used to remediate acid mine drainage. AMR is underwritten in part by grants from the Mining Foundation of the Southwest and AMIGOS. 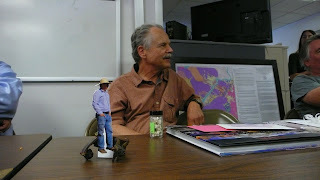 Jon's last geologic map, "Geologic map of the Cross Roads 7.5' Quadrangle and the southern part of the Gene Wash 7.5 Quadrangle," was officially released on Friday as an AZGS publication and it was formally dedicated to Jon in recognition to the understanding of the geology of Arizona. Citation: Spencer, J.E. and others, 2015, Geologic map of the Cross Roads 7.5' Quadrangle and the southern part of the Gene Wash 7.5 Quadrangle, La Paz County, Arizona, and San Bernardino County, California. Arizona Geological Survey Digital Geologic Map DGM 111, 1 map sheet, 1:24,000 scale. Dr. Jeri Young, who runs the state seismic network for AZGS cautions that the preliminary locations from the USGS are off by 5-10 km, when the Arizona stations data are incorporated. The quakes are in the midst of a number of active faults that comprise the southern end of the Intermountain Seismic Belt and close to the Washington fault. This blog passed the 2 million page views level today, so thanks to all of you readers. It probably passed that point some time ago, but I did not start tracking analytics until a year into blogging. I've made over 4,100 posts since beginning, but this past year my blogging has dropped off precipitously. That is a factor of being over-committed on projects, and a recognition that more viewers visit our Facebook page run by Mike Conway. The Facebook page is actually better suited for a lot of the more regular announcements that I used to post here. Our Facebook page also reaches out to a larger more diverse audience. 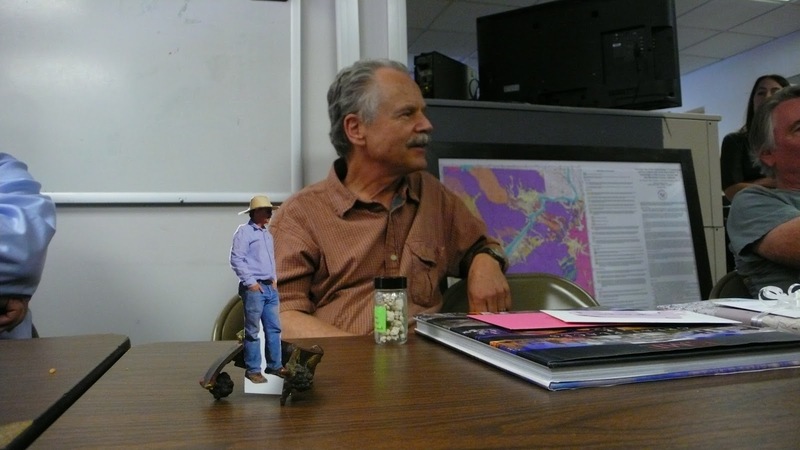 Arizona Geology is still targeted to the geoscience community. But I've also heard from a number of news reporters who follow the site to catch items that would be good stories.